A. Wilson Shelley was born in the town of Gaines, about one-half mile west of his present residence, on 27th of July, 1837. The family spring from English ancestry, three brothers of the name coming from that country to America more than 150 years ago. One settled in Maryland, one near Saratoga, N.Y., and the other in the South. His grandfather, Aaron Shelley, emigrated from Washington county, N.Y., to Gaines in 1812, settling where the Widow Montrose now lives. He was a skilled mechanic, a farmer and a general dealer, and erected on Otter Creek the first saw mill in the town, and also built and kept the pioneer tavern on what is now the Whipple farm. His wife was Mary Wood, and their children were: Eunice, Nathan, Betsey, Amasa, Lucy, Ambrose, Mary, and Laura, of who only the last named is living. She was born in 1810 and resides in Eagle Harbor. Amasa shelley was born in Washington county May 26, 1801, came to Gaines with his parents in 1812, and died here November 21, 1868. He was a millwright, a good mechanic, and a farmer, and with a Mr. Noble built at West Gaines the first cider mill in town. With him also he placed in operation for George Kuck at Kuckville, in Carlton, the first run of stone for grinding in the county. He married, first, September 7, 1828, Sylvia, daughter of Nehemiah Pratt, of Gaines. She died January 31, 1834, and he married for his second wife, August 11, 1834, Ann, daughter of David Wilson, of Orange county, by whom he had five children: Sylvia A. (Mrs. Seth Jones), of Kendall; A. Wilson, Solomon A., of Gaines; George W., of Barre; and William Henry, of Gaines. Mrs. Amasa Shelley died January 21, 1892. One of her brothers served in the war in 1812. 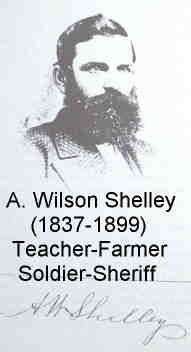 A. Wilson Shelley was educated in the district schools of his native town and finished in the academies of Yates and Albion. He then engaged in teaching winters and working on the farm summers, avocations he followed until September 1, 1862, when he enlisted in Company D, 151st N.Y. Vol. Inf., as a private. Going to the front with his regiment, he participated in all its engagements, notably the batles of Locust Grove, Monocacy, the Wilderness, and Spottsylvania, and at Cold Harbor, on June 1, 1864, was severely wounded just below the knee. In the mean time he had been promoted corporal, and after lying several months in the hospitals of Judiciary Square at Washington, Fort Schyler in New York city, and the General Hospital in Buffalo, he was honorably discharged as corporal December 21, 1864, on account of the gunshot wound he had received, upon the consolidation of the regiment. Returning home he was State census enumerator of Gaines in 1865 and in the fall of that year went to Missouri, where he remianed eighteen months, ten of which were employed in teaching school. He again returned to Gaines, purchased the farm he still owns near Kenyonville, and taught school two or three winters. He followed this latter vocation in all fourteen terms. He has always been a farmer, and has also been engaged more or less in dealing in produce. He settled on his present farm, two miles west of Gaines village, in 1883. Mr. Shelley has ever been thoroughly identified with the affairs of his native town and county, and in various capacities has always merited the confidence and esteem of his fellow citizens. He is a staunch Republican, giving his party his unqualified support. In the fall of 1889 he was elected sheriff of Orleans county and served a term of three years with signal credit and ability. He is a member of the County Agricultural Society, of Renovation Lodge No. 97, F. & A. M., of Albion, of Albion Lodge No. 67 A. O. U. W., and of Bates and Curtis Post, G. A. R., of Albion village. Shelley, A. W., is a descendant of Aaron, who was a native of Washington County, and settle in Gaines in 1811, where he built the first house on the Ridge Road, and also kept the first hotel in the town. His son, Amasa, father of our subject, was born in 1801 and died in 1869 in Gaines. He married Ann Wilson, born in Orange County in 1810, and died in Gaines in 1892. Their children were: Silvia, born in 1835; Aaron W., born in 1837; Solomon A., born in 1840; George W., born in 1845; William H., born in 1840. Our subject attended the common schools, finished at the Albion Academy, which he left before graduation, and went to Pike's Peak during the gold excitement. e has chiefly followed farming, has always been a Republican, and was elected sheriff of Orleans County in 1889, which office he held for three years. In September, 1862, he enlisted in the 151st N.Y. Vols., and served two years and eight months. He participated in the battle of the Wilderness, was wounded in Cold Harbor, fought at Locust Grove, and was discharged in December, 1864, for honorable service. Mr. Shelley is a member of Renovation Lodge No. 97 of Albion. F.&A.M., also G.A.R., and of the A.O.U.W., No. 67 of Albion. September 16, 1872, he married Marietta Broadwell, born December 16, 1839 in Gaines, a daughter of Mosses Broadwell, born in Plattsburg in 1812, and died in 1883 in Gaines. Her mother was Marietta Dolley, born in Fonda in 1815, and died in 1867 in Gaines.